Kukharenko, Yakiv [Кухаренко, Яків; Kuxarenko, Jakiv], b 1799 or 1800 in Yeiske in Kuban, d 26 September 1862 near Maikop, Kuban. Writer, ethnographer, and major-general. He attended the Katerynodar Military Gymnasium and became a career army officer in 1823. 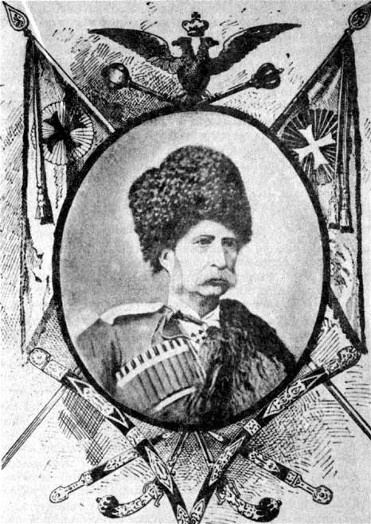 In 1851 he became the acting otaman of the Black Sea Cossack Host (see Black Sea Cossacks). 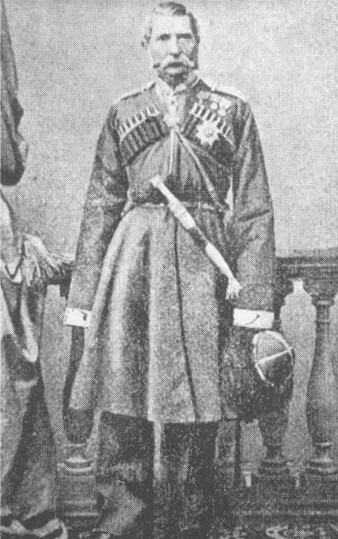 In 1842 he met Taras Shevchenko and they became lifelong friends; Shevchenko dedicated his poem ‘Moskaleva krynytsia’ (The Soldier's Well, 1857) to him. Kukharenko's ethnographic play ‘Chornomors’kyi pobut na Kubani’ (Black Sea Cossack Life in Kuban, 1836) was published in Osnova (Saint Petersburg) in 1861 and adapted in 1877 by Mykhailo Starytsky as the opera Chornomortsi (The Black Sea Cossacks), with music by Mykola Lysenko. Osnova also published his ethnographic studies about Kuban Cossack volunteer guards (1862) and shepherds on the Black Sea littoral (1861), and the folk tale ‘Voronyi kin'’ (The Black Horse, 1861). He died as a prisoner of the Caucasian Abkhazians and was buried in Katerynodar. Posthumous collections of his works were published in Kyiv in 1880 and in Prague in 1928.